Jake’s Wayback Burgers began in 1991 as Jake’s Hamburgers with a single restaurant in Newark, Delaware, which still occupies its original location on Route 273. Now, over 2 decades later, Jake’s Wayback Burgers is noted as a better-burger fast casual restaurant chain with over 70 restaurants open and over 200 restaurants sold in the United States. Since inception, Jake’s Wayback Burgers has made its reputation for fresh burgers and thick, hand-dipped milkshakes a staple in every community. Jake’s Wayback Burgers is the re-imaging of the Great American roadside burger stand. It’s a throwback back to an era before Eisenhower and Interstate highways, before drive-in movies, sock-hops and poodle skirts, before Howard Johnson began the process of homogenizing the food people ate across the country. Jake’s Wayback Burgers prides itself on serving delicious and fresh, hand-made never frozen burgers and hand-dipped milkshakes amidst an atmosphere that hearkens back to a simpler place and time – a time when “customer service” meant something, and everyone felt the warmth of the community. The restaurant offers rich, thick milkshakes made the old-fashioned way by hand, using only fresh milk and hand-dipped ice cream. 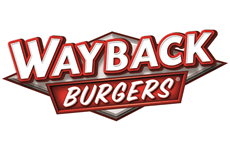 Jake’s Wayback Burgers also offers crispy and grilled chicken sandwiches, all-beef hot dogs, veggie burgers, turkey burgers, and house-made chips, as well as the famous Burger and Shake of the Month. The diverse menu of signature burgers, signature sandwiches, signature dogs, milkshakes, salads and sides offer guests many fresh and delicious choices to choose from. On many levels, Jake’s Wayback Burgers celebrates the little guy, the local sports team, the small-town hero, the people, places and events that give a place its soul, its roots. It wants to be part of the neighborhood, part of the community. It’s the franchise that promises an owner a chance to carve out their piece of the pie without selling their soul to get it. It holds all hope of a “rags-to-riches” story. It’s a small business, a good business, and it will always feel that way. The Jake’s Wayback Burgers experience is familiar, classic, homegrown, and humble. It’s the small-town greasy spoon without the grease. Jake’s Wayback is not slick, modern, hip, or urban in its appeal. It is not a cold place, but warm and comfortable and feels well-used. A core aspect of the Jake’s Wayback Burgers brand experience is the concept of “doing things the right way”, and this idea can be seen throughout every aspect of the organization. This starts at the Corporate Level: building a knowledgeable, experienced leadership team, finding operators who can run franchises effectively, and supporting those franchisees at every turn; from effective brand marketing and promotional efforts, to distribution and operational support. At every level of the organization, Jake’s Wayback Burgers hires good people that are knowledgeable and hard working. Franchisees are treated like partners and feel as though they are part of a solid and constantly growing enterprise, which they can be proud of. Way back in the day, people pulled together to achieve a common goal. That collaborative spirit lives on today in the Wayback Burgers franchise family. Our franchise owners experience unwavering support through initial and ongoing training, as well as support from your assigned Franchise Coordinators, Marketing, Purchasing & Distribution (P&D) and Quality Service Control (QSC). It’s a team approach to success. Early Development Opportunity – Be the first Wayback in your desired markets. Experienced Franchise Leadership – The same names that have propelled brands like Blimpie and Edible Arrangements into the international spotlight are behind Jake’s franchise trajectory! Low Investment – Average initial investment in a Wayback unit is only $250,000 USD including opening fee. Best Unit Economics in Class – Smaller spaces allows for greater efficiencies. A Fast Casual Dining Experience, not Fast Food – Each of our award-winning burgers takes a little longer to make… but your customers will soon be telling you it’s worth the wait! We Are Looking for experienced operators with clear, aggressive plans.